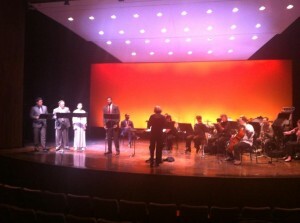 Duffy’s Cut(2013) was commissioned by the Washington National Opera American Opera Initiative, and was premiered in the Terrace Theatre at the Kennedy Center on November 13, 2013. Her writing was praised as showing a “flair for full-bodied, operatic sound,” (Washington Post), and “using contrasting rhythms and clever harmonies to an intriguing effect” (Huffington Post). The work camp of Track Mile 59, known as Duffy’s Cut, in rural Malvern, Pennsylvania. The ground is scarred from the effort of cutting away the hillside and creating a fill, or land-bridge, over the valley below for the Pennsylvania and Columbia Railroad. Some yards away from the worksite, the door of the Irish workers’ abandoned shanty flaps desolately in the late summer breeze. The tools of their labor—a wagon half-filled with dirt, shovels, and pickaxes—as well as the sundry remains of their daily lives—bone pipes, tin cups, empty whiskey bottles—lie scattered, forsaken, over the ground. For an audio recording, please contact info@jenniferbellor.com.